Our Touch the Earth Tour is a tranquil way to harmonize your energy with the earth, or simply relax and bask in the beauty of iconic red-rock formations. 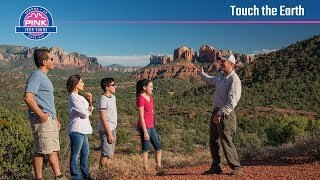 For thousands of years, travelers have flocked to Sedona’s energy vortexes, considered to be unique areas where energy flows from or travels into the earth. Whether you’re slightly curious or truly faithful, you’re sure to appreciate the calming nature of these world-renowned sites. Your journey starts at Pink® Jeep® Plaza in Sedona, where you’ll board a custom-built open-air Pink® Jeep® Wrangler. Your tour guide will take you to Mystic Vista or Airport Mesa—vortex sites that have long attracted travelers in search of self-awareness, healing and spiritual experiences. Mystic Vista is a butte with 360-degree views of the area. Legend has it that this has been a sacred ceremonial site for 2,000 years. Airport Mesa is the closest vortex to the center of Sedona, with twisted juniper trees and panoramic views of the city and surrounding red rocks. During the Touch the Earth Tour, you’ll also get picture-perfect perspectives of Cathedral Rock, one of the most photographed landmarks in Arizona, and Boynton Canyon—home to the ancient Sinagua cliff dwellings. There are only a few places in the world that can claim to be truly connected to the earth’s energy. Once you experience these unique destinations, you’ll head back feeling peaceful, revitalized and ready for your next journey with Pink® Jeep® Tours. Little pricey for a two hour Jeep ride. Josh was Great, actually Awesome would be a better description. We were able to see the sites we were interested in and spend enough time without feeling rushed. Everything was perfect for all of us. Unbelievable. Awesome. Exceeded our expectations. Loved it! Never would have seen where we went if it wasn’t for this tour! Laura was amazing-our group had various needs (back issues, hard of hearing) and Laura accommodated us with grace and kindness. She also took great photos of our family that we will treasure for years to come.